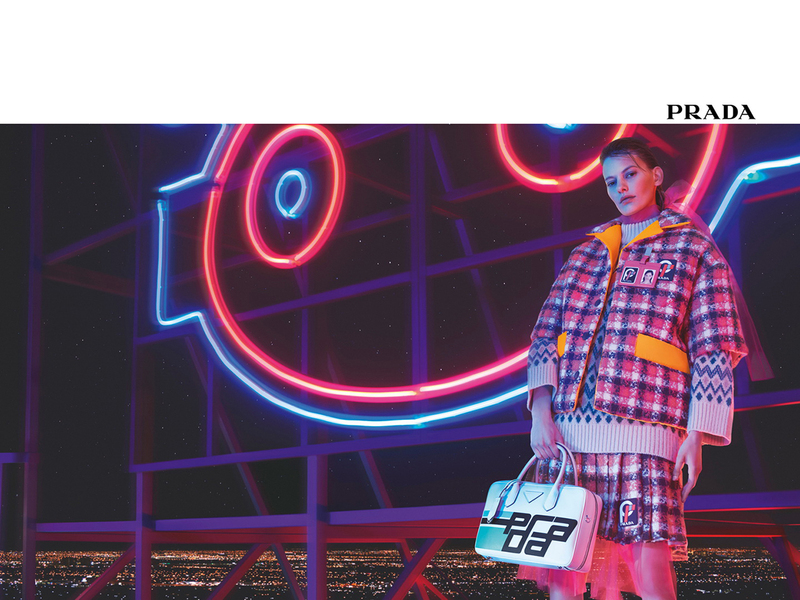 Neon is a key feature in Prada’s Fall-Winter 2018 runway collection for women, evident in the bright and bold RTW pieces and neon-accented leather goods that came down the runway. If you revisit the runway show, some of the pieces were printed with ‘blurry neon lights’ channelling flashes of light from a car at night, one that’s translated to equal perfection in the Italian label’s latest advertising campaign titled Neon Dream. 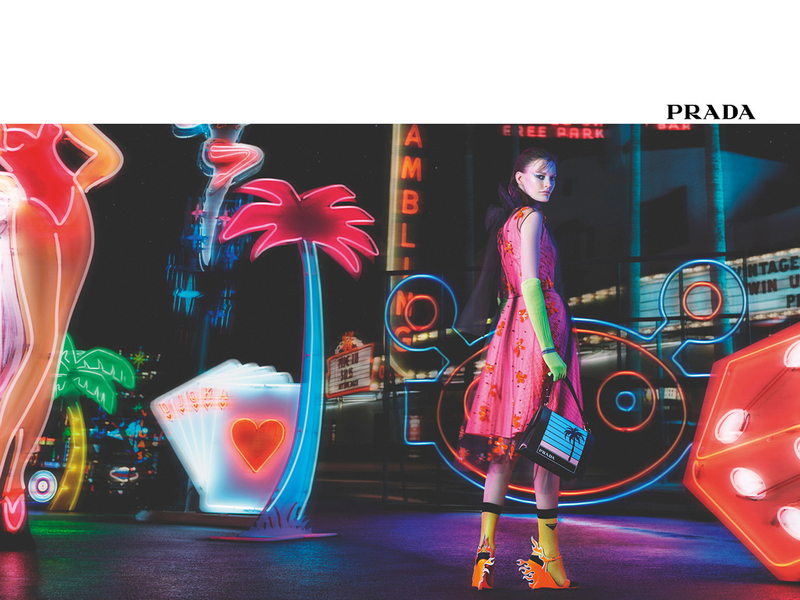 Set against the Las Vegas cityscape, the campaign pictures Amanda Murphy amongst blurry, fluorescent neon hues of orange, pink, red and yellow contrasting beautifully against the blue-black night sky. Running through the images, you will find bags tagged with OMA, which signify the collaboration with the research and design studio that also handled the scenography of the womenswear show held in the OMA-designed Fondazione Prada complex. Working with OMA, the team designed all new graphics and prints such as the PRADA text logo and a rework of familiar favourites like the banana and the monkey. First up, the OMA Elektra (SGD3430, shown above), a flap bag that comes with the robot motif that has grown to become a Prada icon in its own right. As for the heels, they are none other than the signature Flame Heels (SGD1940) that makes a comeback in all-new neon hues like a vibrant orange and another in pink which makes an appearance below. Next, the Mirage with top handle (SGD3170) is very much like an ‘optical illusion’ where the words on the triangle logo seem to be replaced with the PRADA text at the corner of the bag. Coming in a structured shape, this one is perfect for work or formal occasions without being over the top. Now, for those of you looking for a classic shape but with a twist, that’s where the OMA Promenade (SGD3420) comes in, with a graphic flame heel printed right on the front of the bag. The Coulisse Heels (SGD1500) is another new-in for F/W18, one that features pink laces sealed with a cord lock, making slipping in and out way easier. Rounding up the lot are two of Prada’s classic bag silhouettes injected with fresh prints on the exterior. 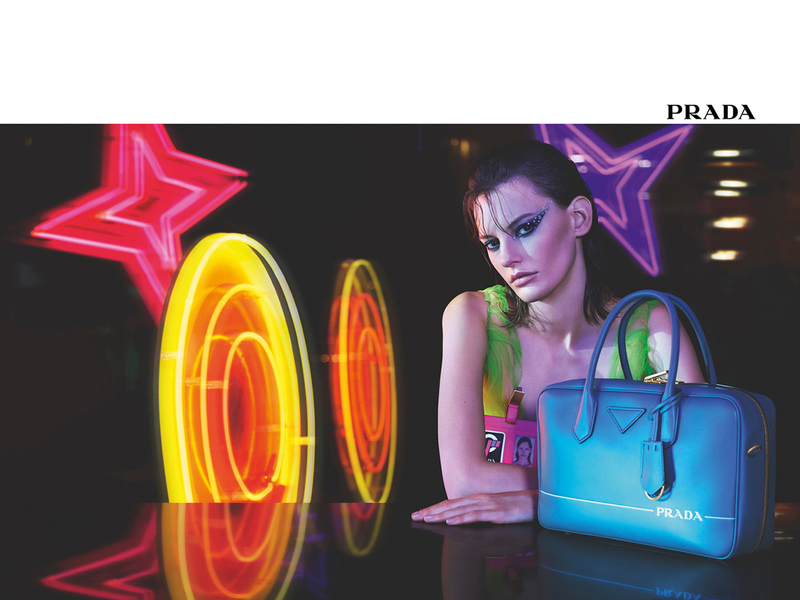 The Frame Bag (SGD3460) features a palm tree, while the OMA Bauletto (SGD3420) comes decorated with a huge PRADA logo, one that you will have no trouble spotting from miles away. Pieces from the collection are making their way into boutiques (or are already here), so it is best that you make a trip down or ring up your Prada SA to reserve some of the pieces the moment they land on our shores.